Arsenal head coach Unai Emery has warned Mesut Ozil he must help his team-mates to defend as he calls for commitment from all of his players. The Gunners travel to Chelsea this evening on the back of a 2-0 home defeat to reigning Premier League champions Manchester City in Emery's first game in charge. The Spaniard replaced Arsene Wenger in May and is attempting to introduce his own style and philosophy after more than two decades under the former manager. Playing out from the back is one of those changes, as is encouraging his players to press across the pitch - demanding more from his forwards as he looks to defend from the front. Ozil has come in for criticism for a drop in effort at times but, under Emery's new system, Arsenal's highest-paid player will be expected to muck in. The former Real Madrid man endured a tough summer, culminating in his acrimonious retirement from international duty with Germany following a disappointing World Cup. When asked about the defensive duties placed on Ozil in the City game, Emery replied: "Every player needs to (defend) in the true moment of a match. "There are defensive moments and attacking moments. Every player each needs this commitment. "For me, we need to start together, whether we are attacking or defending. I want that from every player. "The position, he (Ozil) is playing all his career like a number-10 player, like a right-winger going inside to receive the ball. "It's clear he needs the ball more to give more options in the attacking moments. "He needs to do (it) in each match, be demanding for us but defensive moments are for each and every player." 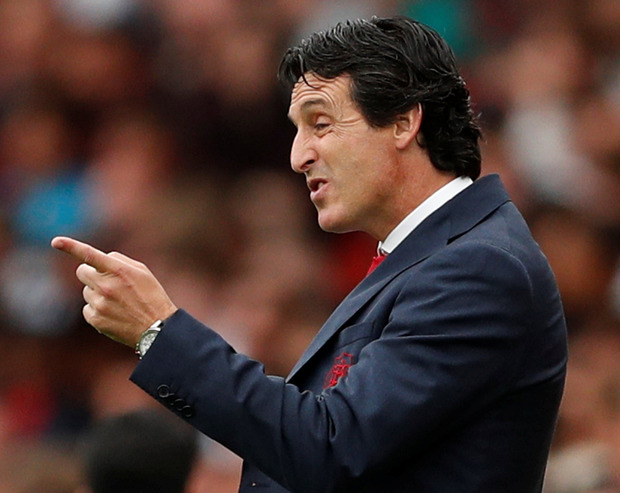 Emery stuck with a tried-and-tested 4-2-3-1 formation against City but has hinted the system, as well as personnel, could change until he finds the right formula. "It depends on the performance and if the performance is good," he said when asked about trying different systems. "I want to give them the chances in each match and maybe we need a lot of matches for the chances for every player but we started with the pre-season and every player is playing for chances and minutes and with all the competitions. "We only play Sunday, Sunday, Sunday but in September we will start playing Sunday and Thursday and also we are going to play more matches and I think every player will get chances to show us his performance for the team." Meanwhile, Gunners defender Shkodran Mustafi believes there is an "aura" around Emery and feels he can take the club forward. Mustafi started the opening-weekend defeat at the heart of the Gunners' defence alongside new recruit Sokratis Papastathopoulos and admits he has been impressed with Emery since he took charge. "When I first met him, he had this aura that he knew exactly what he wants to do, what he wants to be working on, what are his priorities and he was very detailed," the Germany international said. "He was not trying to show us new football but he was trying to put one idea into the team which is the same for everyone and we work for the same things. My first impression was that he is someone who really knows what he wants and really sticks to his idea." Mustafi has come in for criticism since his big-money move from Valencia in 2016 but the 26-year-old believes Emery can make him a better player moving forward. "Every manager is managing the team in a different way - with Unai, a few things changed and I quite like the things that have changed," he added. "I quite like the idea that the coach has on how he wants to play. He is going to bring us forward because he knows exactly what he wants to do and what he wants from the players. "He knows exactly what kind of game we want to play. We had a lot of meetings and the boss told me what he thinks he sees as very positive in my game and what I can work on." Arsenal will be without Ainsley Maitland-Niles at Stamford Bridge after he suffered a minor leg fracture against City - but Nacho Monreal is likely to return at left-back while Lucas Torreira will be pushing to make his full debut in midfield. Another player who won't make the trip across London is England youth international Stephy Mavididi, who has left Arsenal to join Juventus, the Gunners have announced.